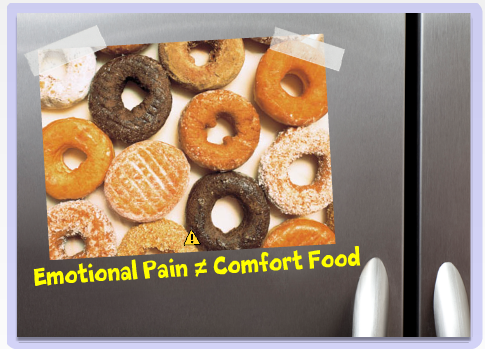 Emotional Pain as a Comfort Food? It’s not what you think! Do you choose emotional pain as a comfort food? I know, this is a shocking and controversial question. But it begs to be asked ~ and answered, by you and by me. I’ve been watching way too much tv the last few days because I’ve been sick. Nestled on the couch with kitty and remote, I’ve observed and napped through several shows. I had thought it was wasted time until I came across this little nugget that has made me start to think differently ~ and that has made it all worth-while for me. There was a woman who was traumatized ~ emotionally, physically and sexually abused who had trouble in her relationships. As the show progressed, one observation came out ~ she was more comfortable with her emotional pain than she was in the unknown that lay before her in order to heal. Does that make sense to you? Think about it. If you’ve endured any type of abuse, do you find that living with that familiar pain is somehow more comforting to you? Does it allow you to understand when you’re feeling trepidation in trying new things? Does it act as an excuse, a way to bend the rules for yourself and to allow certain actions or thought processes because you’ve been mistreated in the past? Is it an automatic anchor of “why I think/act/am this way?” Have you’ve learned how to live with this pain so well that you function despite it? Do you hoard it away, allowing it to be your own secret excuse as to why you’re not getting what you want out of this life? Because I’m damaged? Because I was hurt/wronged/abused? Does any of this sound familiar to you? Before you get too far into wanting to strangle me for what I’ve written, I want you to take a minute to see if/how/why you are reacting so strongly towards it because that was my first inclination as well. It took meditating and sleeping on the thought overnight before I realized how my strong reaction to ‘of course I act this way because of x, y, z happened’ mellowed with the vision that it’s my strong-willed emotional pain that I use as a comfort food when I am too afraid to break the bonds that have bound me for so long. Think about it. Are you using your own emotional pain as a comfort food? Are you ready to choose light over pain as a comfort food?